Technique and practice can save even the most fumble-fingered. I am a borderline klutz, the guy who reaches into the medicine cabinet for the aspirin bottle and knocks over everything else on the shelf. In elementary school, I was the kid who could not hit a baseball or shoot a basketball; my hand/eye coordination was dismal. I was in junior high before I realized that I could run fast and jump pretty far, which helped me win a track and field scholarship to college. Once there, I came to realize that track is a very technique-driven sport and that while natural ability is always a factor, a person with fewer natural gifts could still be a darn good track athlete if he or she focused on the technical aspects and practiced hard. Early in my law enforcement career, I was sent off to semiauto pistol instructor school when our newly created SWAT adopted autoloaders. I worked hard and was able to get through the course without looking too foolish, but after my return, I was not much of an instructor as I had difficulty performing the skills I'd learned. Thinking back to my track and field days, I pulled out some of my old training books and began to review the sections on physiological efficiency and started to apply them to pistol shooting. Thus began my journey to find the simplest and easiest way to shoot a semiauto pistol, a journey that continues to this day. I quickly realized there are only so many ways to work a pistol, but by applying the physiological efficiency lesson I had learned, I was able to put together a "package" that worked well for me. The first thing I realized is that both the magazine and gun must be motionless in order for the insertion to take place. That does not mean the shooter could not be moving, but the gun and magazine must be stabilized at the moment the two meet. I discarded the technique of keeping the gun extended out in front of me and bent my gun-side elbow so it would rest against my torso. I found a location that is comfortable and natural and would allow me to re-create it by feel and without conscious thought. I learned how far to twist my shooting hand so the magazine well would meet the spare magazine at the angle that my support hand was in naturally. On the bottom inside edge of the magazine well I placed an orange dot so I could re-create this same angle. By doing so I could quickly glance down and see that the grip-to-magazine angle was correct, and I could do it consistently every time. I also noticed that as my shooting hand thumb depressed the magazine release button, my forearm muscles tightened up. When these muscles tightened, my gun arm was more stable than during any other time during the reloading process. With the elbow braced against my torso and my forearm stiff, this was the best time to insert the magazine. Thus, I started to hold off ejecting my spent magazine until I had my spare out of the pouch and near the bottom of the pistol. In the beginning, I would look for the orange dot on the inside of the magazine well, but with time I was able to re-create the correct angle by feel, which allowed me to reload while keeping my eyes downrange--even when I was moving. Though I tried different ways to grip the magazine, I found the tried and true method of placing the index finger along the front of the magazine was best. 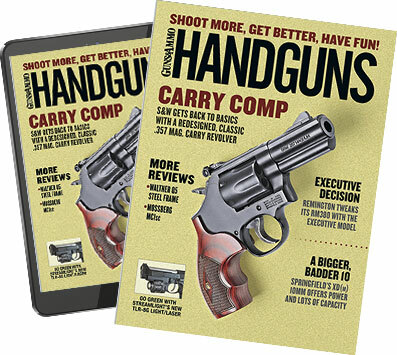 The best way I have found to achieve the index finger grip is to insert the thumb behind the magazine first and let the rest of the hand fall in place. The major problem for uniformed personnel is that most duty pouches have a flap over the magazine to help hold it in place. When worn in the upright position, there is little if any room to get the thumb behind the magazine. For this reason, I have found it easier to wear spare magazines on their side, which does offer some space to insert the thumb to the rear once the flap is open. I would also suggest the use of snaps instead of hook-and-loop fasteners such as Velcro on duty pouches because a snap can be released with one motion while the hook-and-loop style must be pulled or ripped open. I continue to index the back of the magazine against the back of the magazine well, although master shooter and instructor Frank Garcia makes an excellent argument for using the side of the magazine against the side of the well as it offers a longer surface--especially with single-column magazines. I show my students both methods and let them pick the one that works best for them. After perfecting this method, I was able to get my shot-to-shot reload time to less than one second with my Glock 19. But the government was paying for my ammo at the time, and a lot of bullets went downrange to get there. These days I find I can do a shot-to-shot reload in 1.5 seconds with considerably less practice, and while half a second may sound like a lot of time, keep in mind that a blink of an eye is .32 seconds. If you have an efficient reload, then don't mess with it. But if you struggle with it as I did (and still do), try the method I have described here and see if it doesn't help you.